With the publication of his first book, set for April 2014, Dr. Dennis Austin Britton is poised to bring the English literature research that he has labored on since graduate school to a wider public audience. The book, Becoming Christian: Race, Reformation, and Early Modern English Romance, has been described as “an exciting study that offers a theological account of race and racialization” in early modern England. For Britton, the publication of Becoming Christian will mark the latest in a series of noteworthy early career achievements by the recently tenured scholar. Since gaining tenure during the 2012-13 academic year, the scholar has reached new heights by winning an Excellence in Teaching award from the University of New Hampshire (UNH) this past fall. In addition, Britton recently completed a year-long National Endowment for the Humanities Fellowship at the Folger Shakespeare Library in Washington, D.C. The fellowship helped him finish the research for his forthcoming book. Without a doubt, years of hard work and persistence have positioned Britton as a bright star in the highly competitive and crowded ranks of English literature scholars. Nonetheless, he credits his journey as a scholar to the guidance he received from one of his undergraduate professors at the University of Southern California. As a youngster growing up in a middle-class suburban community just east of Los Angeles, Britton had been a good student whose parents had naturally expected him to complete college and become a professional. “I had grown up with a love of reading and learning,” he says, noting that he is the oldest of three sons in his family. The idea, however, of becoming a university English professor was something Britton had neither considered nor even imagined, he says. Britton recalls enrolling at USC with an interest in earning a degree in architecture. He eventually gravitated to the English department while studying under Dr. Heather James, a USC associate English professor. “[Dennis] took at least two undergraduate courses with me and he showed not just an aptitude but a real pleasure and zeal for study and for literature,” says James, who also invited Britton to take a graduate student seminar she was teaching at the time. “It was in that class that I thought I could see if Dennis really might want to go on to pursue a Ph.D.,” James explains, noting that Britton’s performance led her to urge him to attend graduate school. At the University of Wisconsin-Madison, where Britton earned graduate degrees in English, he began investigating how religious differences among Europeans, particularly expressed in their reactions to Jews and Muslims, shaped what would become for the English people the foundations of their ideas about race and racial identity. 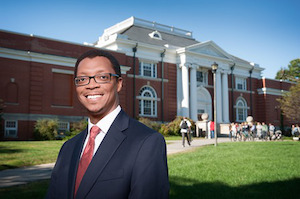 “I think that one of the things that really prompted some of the great work in [Britton’s] dissertation that turned into his book is the realization that, in the Renaissance, it would often be the case that somebody would perhaps feel more different from someone with a different religion than necessarily from someone who had a different ethnicity,” says Dr. Susanne Wofford, a former University of Wisconsin-Madison professor who is now a New York University dean. Now in his seventh year at UNH, Britton, while having established a strong teaching and researching record, has provided valuable service as a role model and adviser to underrepresented minority students as well as to socially disadvantaged students of all races who participate in the school’s federally-supported college success TRIO programs.